Last year was our first official year as homesteaders. For years I read about homesteading, watched youtube videos, made vision boards, and drew out my ideal homestead on paper. In the beginning, I was full of idealistic fantasies about living a back to the land, sustainable, and self-sufficient life. I dreamed of a huge garden, chickens, goats, a dairy cow, beehives, a stocked pantry of harvest-filled mason jars, and solar panels powering the whole operation. I was realistic enough to know to take it slow so I didn’t overwhelm myself. The intention was to take on one new project a year so I could really feel comfortable with it before moving on to the next. I fancied myself to be idealistic but realistic. 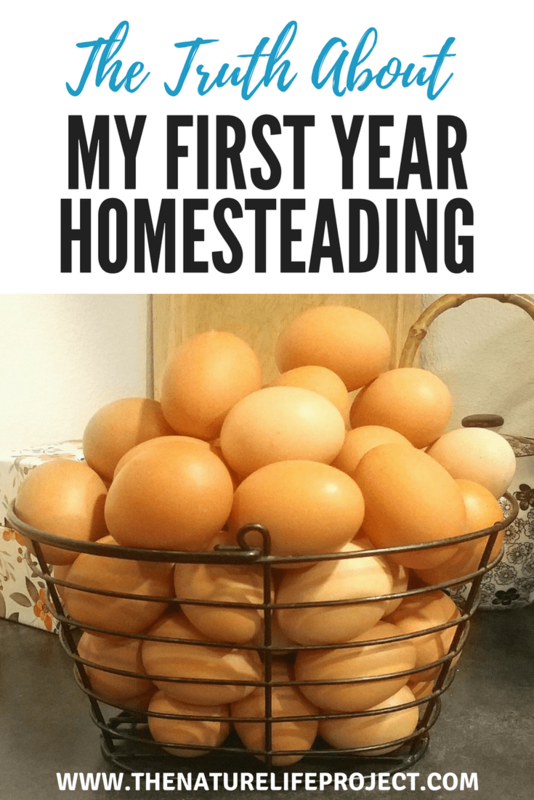 Even so, the number one lesson I learned this past year is just how hard homesteading is, and I’ve barely gotten started. This lifestyle is not for the weak. Originally, I intended to chronicle my (mis)adventures on the homestead here on my blog, but truth be told, I barely had time to get everything done let alone document it. Fail. My goal for the first year was to set up our garden, can our harvest, and get started with a small flock of chickens. These were manageable goals. The year was a success, but man am I tired at the end of the day. My garden is larger than any garden I’ve had before, and not as large as I would like it to be. It was here when we moved in, so I didn’t have to build the raised beds or fencing, but I did need to improve the soil. It was not in the best shape. To do this job, I had a bunch of compost brought in. I would have had them dump it near the garden if I’d been smart, but the hubby didn’t want them ruining the lawn. So for a week, I would fill my wheelbarrow, push it for about an acre, dump it on the bed, spread it out, push the wheelbarrow back and start the process again. Thank God I’m a no-till gardener or the work would have been that much more back breaking. Talk about a workout! Improving the garden with compost and leaf mulch. The bed on the right is how the soil looked when I got here. I layered a luscious black compost and then shredded leaves on both beds and the soil looked so much healthier the next spring. Then I raked up all the leaves on the property, the hubby shredded them with our lawn mower, and then I hauled those to the garden. I’m not in the great shape I used to be, and I think my body got a shock at this level of physically demanding work. That being said, I was impressed with how much my body COULD do after dealing with back injuries and chronic pain for years. It felt good to know that my body could do this work that would feed my family. The feeling of accomplishment after finishing a task like this is pretty epic. It is hard work that feels really good to do. The day-to-day gardening work is time-consuming. My past smaller gardens didn’t take near as much time, and I’m constantly questioning whether or not I want to expand because of this. I will have to if I want to feed my family completely from the garden. But I also want to make sure I have the time and energy to handle all of the work. In a small garden, I can get away with an afternoon once a week to prune and harvest, but a larger garden demands a few hours everyday to keep up. Now I understand why farmers rise with the sun. I wake up earlier than I ever have before in order to get it all done. Sitting down in the evening has never felt so good. Regardless of the challenges a large garden brings, it is still my absolute favorite way to spend my time. I just need to tough it out until my back adjusts. There is nothing quite as enjoyable as an afternoon in the garden–the fresh air, the birds chirping, the chickens clucking, the bees buzzing around me, hands in the dirt, the sun on my face, the taste of fresh food warmed by the sun, and the awe in watching things grow day by day. No, there is nothing as enjoyable to me as gardening. It is worth every blister and sore muscle. Everything on the homestead seems to take so much more time than I think it will. Canning is a perfect example. The first time I did it, I spent an entire day canning 8 jars of dilly beans. I had to harvest the beans, wash them, cut them into the right size, prepare the jars, fill the jars, and water bath them. For 8 jars. I remember asking myself that day if all of this work was really worth it, but was quick to give myself a pep talk assuring myself I would get faster and more efficient with time. I now see why people get together to do their canning. Many hands make light work. Plus you get to socialize with people you love while stocking your pantry with delicious food. I was lucky enough to experience this twice this past year. Wanda taught me to can my husband’s grandmother’s pickle recipe. Such a priceless experience. The first time was with Wanda. She is 85 years old and one of the sweetest women I’ve ever met. Her family has been close friends with my husband, Owen’s, family for generations. I met her for the first time this year. When I told her I wanted to learn how to can, she was quick to offer her help. She wanted to show me how to can Owen’s grandmother’s pickle recipe. This was the last year she planned on canning and wanted to pass the tradition on to the next generation. I was honored to take the reins. 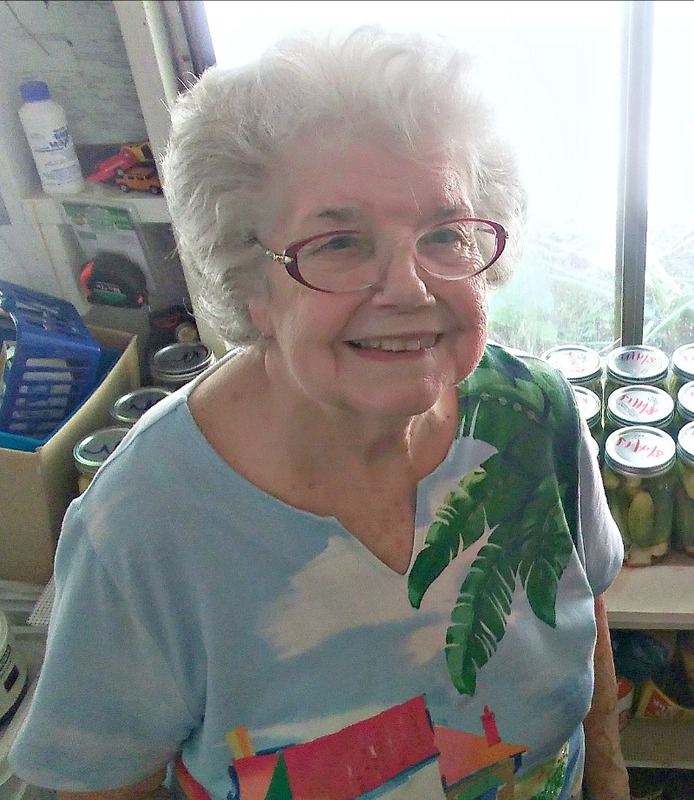 She taught me why my first canning attempts were so slow…because I was slow. Wanda moved FAST! You could tell she had done this for her entire life. There was no dilly dallying when canning with Wanda. She had her assembly line set up. 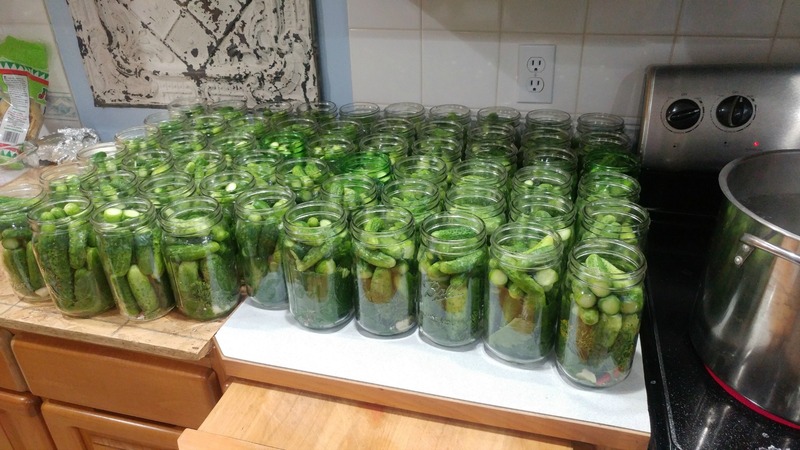 Wanda scrubbed the cucumbers quickly, put the ingredients in the jars quickly, and made her brine quickly. She did everything quickly. We made about 40 jars in only 2 hours. 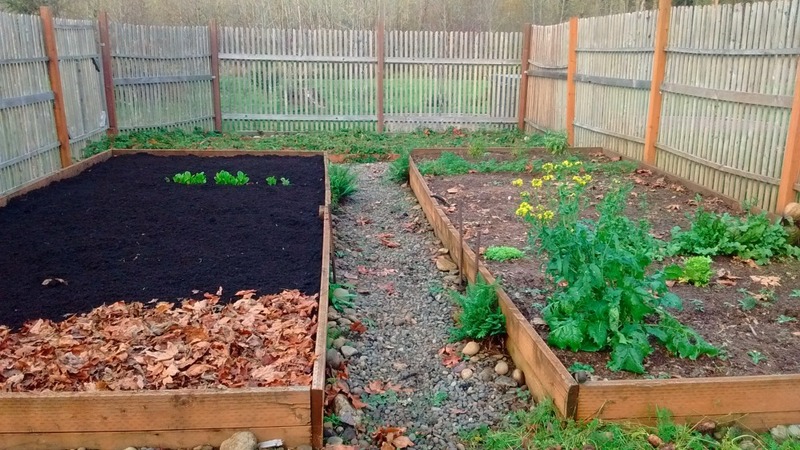 The experience gave me hope that homesteading could be done more efficiently. My second canning “party” was with my friend Sarah. We canned her grandmother’s pickle recipe, and I learned the important lesson that you should rinse EVERYTHING well before you pack your jars. We scrubbed our cucumbers and other ingredients, but we neglected to rinse our dill and we paid the price. As we packed our jars, we started noticing little green critters circling the rims of our jars. Aphids. The dill had been infested with aphids and we hadn’t even noticed. Hours of work had to be redone as we went back and re-rinsed everything and pack the jars again. This was a frustrating and tiring lesson to learn, but a little wine helped. Something I found interesting was that both of Grandma’s canning recipes did not use a water bath or pressure canner. The USDA would probably give me a slap on the wrist, but most of the pickles sealed just fine regardless. 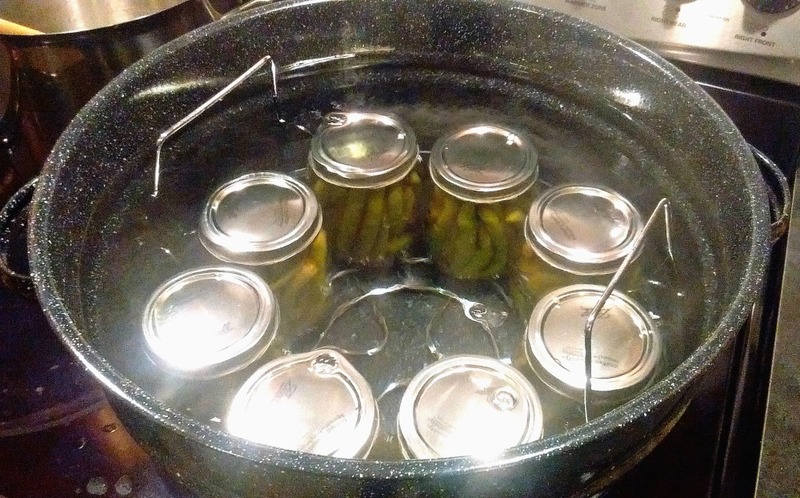 The key was to use hot jars, fill them with hot brine, put the lids on right away, and let the heat seal them. Sarah went the extra step of covering her jars with a towel, and we did have a better success rate doing that. It’s probably safer to use the water bath method, but Grandma’s recipe has worked fine for generations without any botulism casualties. 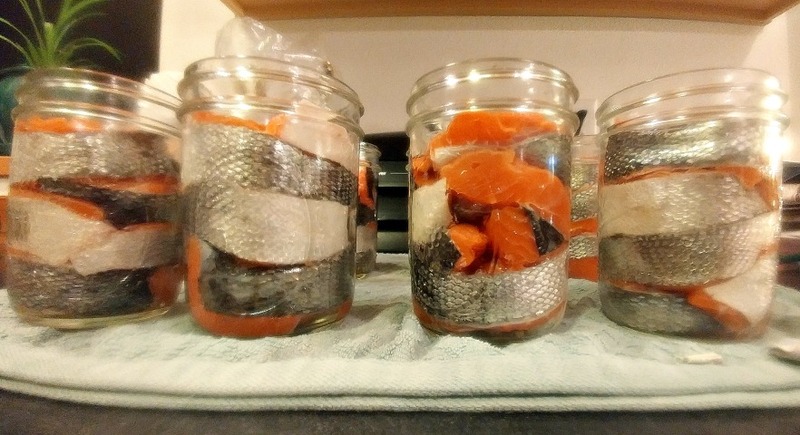 Packing jars for canned salmon. I leave the skin on because it is easier to remove after canning. Just be sure to put the skin towards the glass if you leave it on too. I can say that I am now pro at canning fish. My fisherman husband brings home salmon and steelhead on a regular basis, so I have gotten plenty of practice. The first time, it took me an entire afternoon to can one fish. Now one fish takes less than an hour of prep time plus the 100 minutes in the pressure canner. I’ve learned it is all about timing, moving quickly, and using a sharp knife. I usually run the jars through the dishwasher the night before, or do a quick clean and then steam the jars in the canner for 10 minutes. While the jars are steaming, I cut up the fish with a very sharp knife (there is nothing more frustrating than a dull knife), and am usually done cutting up most of the fish by the time the jars are done. I put the fish in the jars by hand the first time, but it is much easier and faster to use tongs. Then I set up the assembly line: a dollup of vinegar, a bit of salt, wipe the rims, put on the lids and put them in the canner. When I first started I would re-read my recipe a million times to make sure I did it right. However, repetition has gotten me to the point where I can do it in my sleep. Practice makes perfect. I would call the first year of canning a success. I canned dilly beans, pickled asparagus and carrots, raspberry and blackberry jam, pickles and fish. Next year I plan on adding salsa and ketchup to the mix, plus a few other things I’m sure. What started out as a scary and time-consuming endeavor has become quick and routine in one season. I loved giving canned jam and fish as gifts during the holidays. My heart gives a flutter when I see rows of mason jars lining the shelves of my pantry. It’s that sense of personal pride that I love most about homesteading. My dog, Thor, is much more interested in finding chicken poop treats to eat than he is in the actual chickens. Poop. So much poop. That’s what I learned about chickens this past year. I love watching my flock free range, but don’t love dodging their poop every time I walk outside. I don’t love rinsing down my front porch daily since, for some reason, that’s their favorite place to hang out. At first I thought it was cute. Now if I see them, I shoo them away with a broom. I use the deep litter method in their coop. This is essentially spreading out pine shavings or straw and adding more when it starts to smell. This is supposed to create a beautiful compost for the garden. I’ll let you know how that turns out in the spring. I started with pine shavings, but insulated the coop with straw before the cold weather hit to keep them warm. I’ve learned I like pine shavings a whole lot better than straw. Pine shavings have a nice smell and seem to keep the coop looking and smelling nice longer. The straw stinks up a lot sooner regardless of me adding some just about everyday. I think straw is great for insulating the coop for the winter, but other than that I will stick to pine shavings. I’ve also learned that if you let them free range, you may as well give up on having beautiful landscaping. They will tear it to shreds. As much as I love seeing them wander, I do love keeping a beautiful yard. I’ll probably let them free range through the winter to get the protein they need while they are molting. Come spring, however, we’ll need to figure something else out. Either they can stay in their run, I can build a chicken tractor, or we may fence a field in the back. I’ll let you know what we decide. 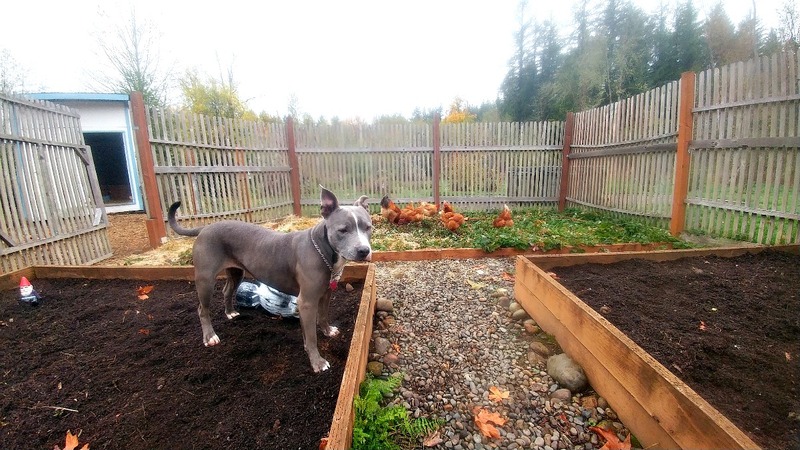 Lola hanging out in the garden with her chickens. Even though these destructive little poop machines give me a small headache here and there, I can’t see my life without them. The worst day can be cured by hanging out with my feathered friends and watching their antics. I love watching them zoom across the yard, wings out like little airplanes, and chase each other for bits of food. It’s so sweet how they follow me around like little ducklings following their mother. I get so much joy watching my dogs hang out with them. And of course, we can’t forget about them feeding me a fresh breakfast every single day. Chickens are the best. 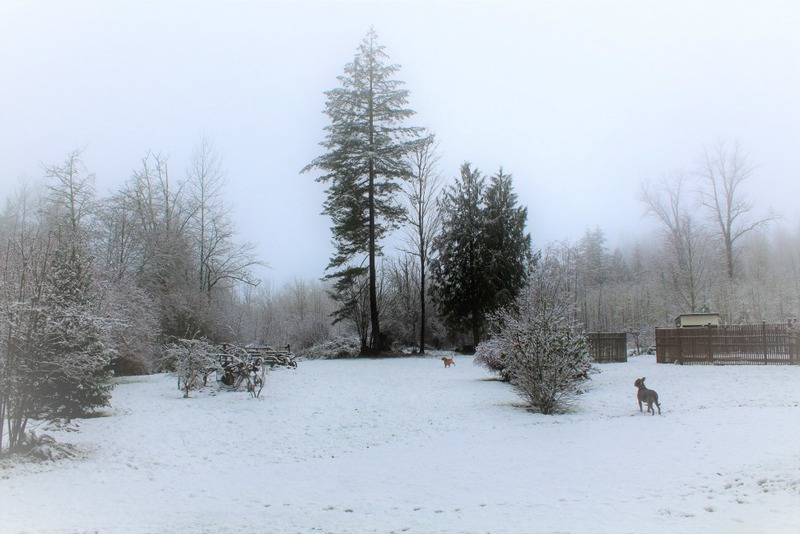 The dogs love winter on our homestead. When I moved to Washington from Arizona as a teenager, I had a difficult time adjusting to the gray winters. The first few years, I came down with a fierce case of S.A.D. (Seasonal Affective Disorder). Ever since, I have dreaded gloomy winter days when the fun in life comes to a halt. This year, however, I am reveling in the rest. After spending the year doing physically demanding work in the hot sun, my body is grateful for winter’s reprieve. This is how it’s meant to be. There is a time and a season for everything, and our bodies need time to rest. I used to fight against this, lamenting how tired I was during the shortened days. Now I enjoy a good afternoon nap. It’s so nice to give my body a rest from the back breaking work of gardening. I love enjoying the fruits of my labor, eating canned goods and sweet onions from my pantry. I feel in tune with the seasons and it feels good. 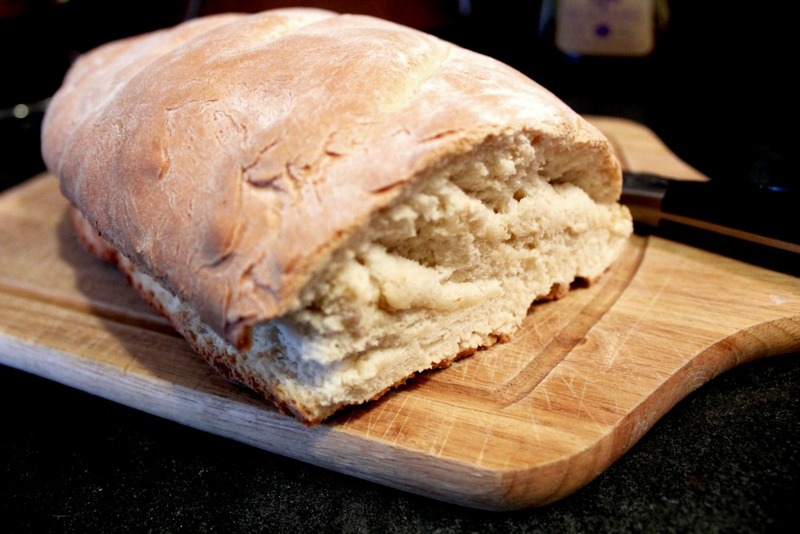 The smell of fresh baked bread creates that hygge vibe during the winter months. Recently, I’ve become obsessed with the idea of hygge, the Scandinavian concept of feeling cozy and comfortable. Winter is hygge season. It is a time for naps and dog cuddles, soft and stretchy clothing, and reading good books. It’s a time for baking bread, hot baths, cups of tea, and planning next year on the homestead. Winter, hygge season, is the time to restore, recharge, and prepare our minds and bodies for the next year. I have yet to fully dive into my plans for next year. Seed catalogs are waiting to be examined. Ideas are floating around in my mind, but I don’t have concrete plans yet. This last year taught me to respect the learning process and acknowledge my own limitations as far as what my body can do and how much time I have. I had originally intended to add bees to the homestead next year. However, I think I am going to wait a year. I would like to maximize what I already have before moving onto something new and spreading myself too thin. This year, I’ll dig deeper into my garden, plant some fruit trees, and possibly raise meat birds. My big goal for this year: time management. If I can master this, I can do anything. Lovely to hear your experiences! We haven’t been at this gig much longer than you have, been on our land for 18 months. But I was lucky enough to grow up on 5 acres and my ma and grandma taught me many things. What I have learned during this journey so far is that I simply cannot do everything. I homeschool, have a toddler, grow a garden, run a blog and an online business. House work has gone by the way side. I love a clean tidy house, but with a 2 year old and 2 other kids housework has diminishing returns. As soon as it is done it is a mess again. SO when I do tidy I do it late in the afternoon so I at least have the evening to enjoy it before they ruin it again! Also we have penned our chickens up. Free range is a lovely idea, but the poop, the destruction and being eaten by our dog (she has got 4 of them so far) is too much for me. Now they have a HUGE pen. Thank you for sharing your experiences Dana! Housework takes a ridiculous amount of time, and I find myself doing less and less of it as the chores pile up. I try to do dishes no more than once a day, or else I’ll drive myself crazy. I’m with you, I love my chickens, but I’m thinking a larger run is the best solution. How nice that you grew up learning these skills. You must have a lot of great experiences to draw from. Poop everywhere just like here. If your chicken run is close to the garden you can simply toss them weeds in return great eggs., also let them out in the evening for a bit just be for roosting will make them and you happy. Look for a crock pot ketsup recipe so so easy and so good. Love you story’s keep up the good life. Love Wanda’s smiles, the dogs and the chickens. Very interesting stories about your experiences + very well written. ?? Thank you Jade. Wanda really does have a beautiful smile–she just beams love. Thanks for stopping by! I just loved this article so much! I think this What you have done is simply amazing! You and Owen have built quite a life together. Thanks for sharing all your experiences! Wonderfully article!! I can relate! I loved your explanation of winter hygge! Thank you Rebecca! Do you have any hygge routines? Great story! You’ve certainly been busy! Thanks for sharing! Yes I have been! lol Thanks for stopping by Angela! They really never do mention all the poop from chickens then dogs trying to eat it! Sounds like my house too lol! I hope this year you are able to build on those learnings and master time management! After losing one of our birds one day and never knowing what happened we keep ours in a run. The first big project when the snow thaws is a bigger permaculture chicken run or yard that I have designed. Thank you for sharing your experiences, have a wonderful week, Emma. Hi Emma, thanks for commenting! Yes…the poop! I am finally getting used to it. lol I would love to see how your run turns out. We lost 2 chickens this past month to predators and are working on enclosing our run now as well. I’ll still let them free range when I am outside working, but want to make sure they are safe when I am not. Subscribe and receive the Homestead Garden Planner as your free welcome gift.  The Nature Life Project is about my journey towards living a simpler lifestyle that is more connected to nature. 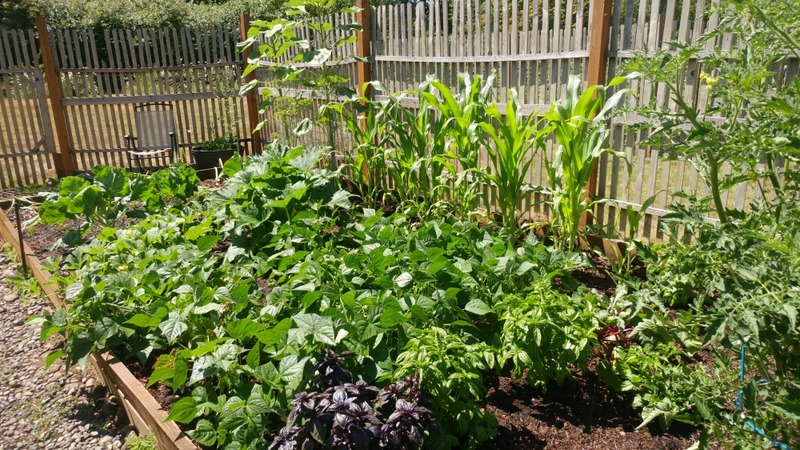 I share our progress, struggles and successes, along with how-to articles about gardening, natural remedies, and the plants you’re growing. I’ll even share a few of my favorite recipes for your harvest. 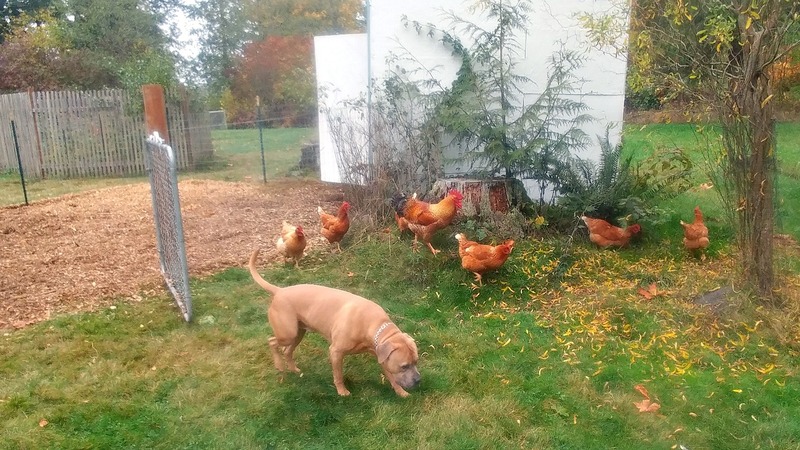 I live on a 6.5 acre homestead in Washington State (Zone 8a) with my husband, our 3 pit bulls, 2 cats, and our small flock of chickens.